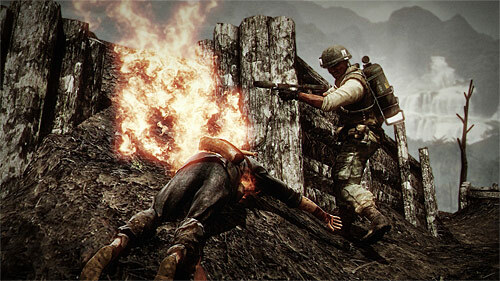 Bad Company 2: Vietnam is here, well at least for PC players who preordered it at the EA store or on Steam. If you are like me you had this preordred weeks ago and now it is finally here. Many games this year have been massive disappointments. Games that we had high expectations of, most of which had high price tags, were complete let downs. Needless to say when I preordered BC2:Vietnam I was concerned. 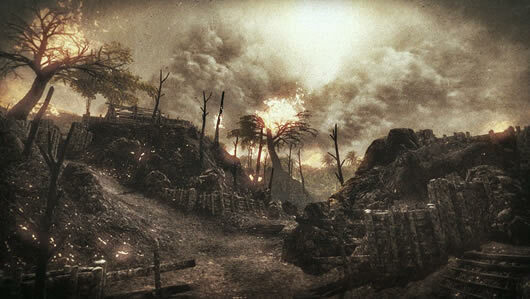 I am happy to say that BC2: Vietnam is superb, Activision take note, this is what DLC should be. 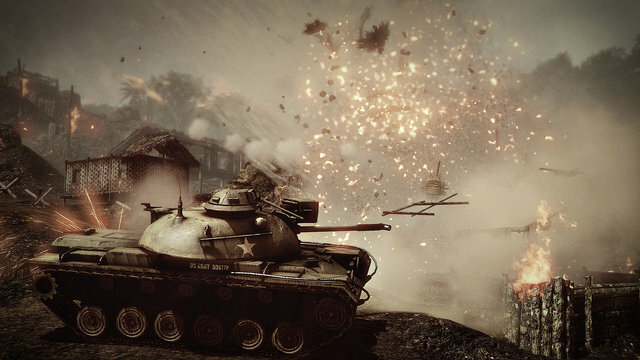 BC2 Vietnam boasts 5 brand new maps, 6 new vehicles, 15 additional new weapons that are characteristic of the time period, 60’s sound track and new voices to boot. In addition to this there are some other weapons that are in BC2 but they are Vietnam era models. With a price tag of 14.99 this is quite a bit of content, especially when compared to the meagre offerings of Activisons DLC which only contain 5 maps and half of which are just rehashes of previous releases on older titles. I may shoot myself later for saying this but this current offering by DICE and EA could of easily justified a $30.00 price tag and if they had a single-player campaign to boot it probably could of stood as it’s own title. Vietnam does not come with it’s own campaign… while this is disappointing to me in one aspect, at 14.99 I didn’t expect one and with the amount of content it had I am quite happy without it. I should mention that this in an Era rarely covered in games and well at that. It would be nice to see a single-player campaign designed around Vietnam. It’s a story still fairly untouched by the game industry. The maps are a real standout for me in this expansion. 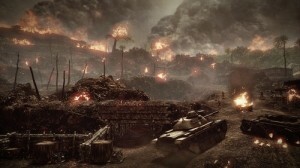 Following the standard Battlefield map layout the maps are designed for 3 types of gameplay. Rush, conquest and squad deathmatch. One map that really stood out to me and actually evoked some emotion from the devastation that I saw around me was Hill 137. If any of you have seen Hamburger Hill, the movie, this map is based off that. If you want to read more about the battle at Hamburger Hill you can read about it here. It’s actually quite an interesting read. The map takes you at the start, playing rush, depending on the side you start on, in the jungle moving up to take command points. 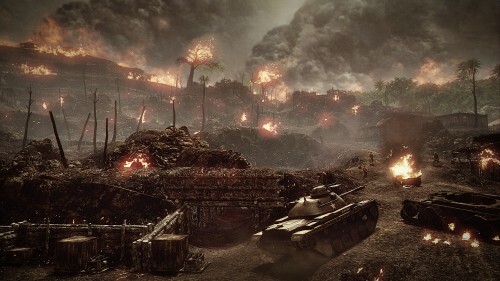 After your team captures the first set of command points you move into the second stage of the map which is a massive hill that has been bombed into oblivion. All you see are burning trees and scorched ground. The fires look real and believable and with the gunfire and the screaming of your squad-mates around you elevates that reality. This is probably my favorite map out of the ones I have played so far. From what I can tell all of the maps will play on all three game modes. This is different from the original BC2 release where only some of the maps were playable in some game modes. Rush mode made a big standout to me on Vietnam as well. 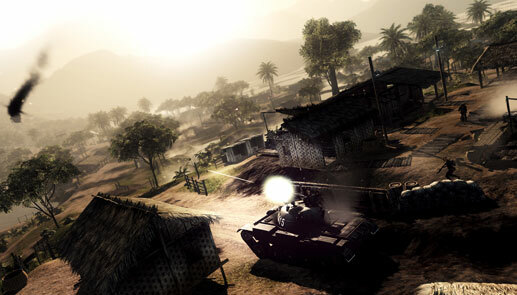 Unlike the rush mode in BC2, and this could be contributed to the way the maps are designed, felt much more focused. There were certain maps where you could literally create a choke point in the map and the only way to break that defensive line is to use a mixture of vehicles, medics, assault and snipers. This results in epic amounts of carnage, destruction and death. Without the proper combination or “teamwork” your team would get slaughtered. That being said, it was very annoying when you got placed on a bad team or one that didn’t work well together. It could make for some very long and frustrating rounds. I’ve found that much like with BC2, Vietnam is best played with a group of friends. I have a group of about 8 guys I play with and when we coordinate together it’s about the most fun I have gaming period. Nothing beats a cohesive team in BC2 or Vietnam. You will walk all over the other team if you have a well coordinated group of guys. If there is one complaint I have about the Bad Company series it is that it doesn’t really encourage the team to play as a team. Instead you just find guys walking around shooting whatever they can see. The weapons are great as well in Vietnam. All of them feel authentic and real and fit with the time period. The only gun that I felt was a little overpowered compared to the rest was the PPSH. The gun has almost double the fire rate of any other SMG and beats most the MG’s in the field as well and it’s far to accurate compared to what the traditional SMG should be. I think the AK47 and the MG60 are my favorites in this expansion, it’s extremely gratifying to drop someone with both of those weapons. Sound follows in the footsteps of it’s predecessor and does not disappoint. When not playing with a group of people I have it blasting on my 1000 watt sound system and close range explosions and MG fire create bass that will knock pictures off your wall. 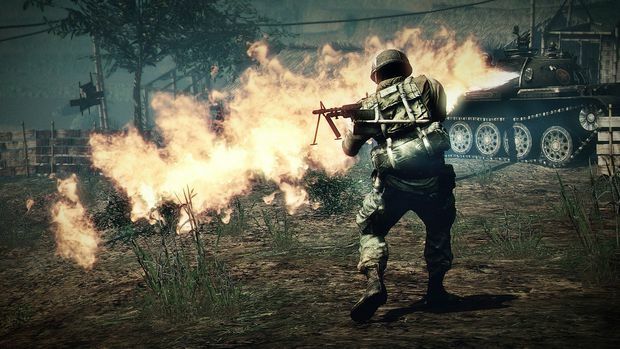 Gunfire sounds superb and when you are in large fire fights with small arms fire, explosions, motors and screaming going on all around you I found that the game feel incredibly immersive and intense. I touched on this a little bit before but the visuals in the game are top notch. Hill 137 again was where they really stood out. I think this is the best looking map in the Bad Company series hands down. I also think the game plays smoother then BC2 did. I don’t think any new graphics were added per say but I think the game was optimized before it was released. I can feel the difference between BC2 and Vietnam. Overall Vietnam looks better then it’s predacessor in most regards with the exception of exploding tree’s. When a tree gets knocked down it creates a paper explosion. The leaves look like thin, flat, green, pieces of paper. This seems like something they could of spent an extra day on but it’s definitely not a big deal. PC gamers will be happy to know that the game has gotten released first on PC and that the game has been optimized for the platform as well. The game plays well and does not feel like it was ported from a console version to the PC. If you have a decent machine, you are in for a real treat. I run the game on medium settings using eyefinity on 3 x 25″ monitors, AMD 965 Phenom X2, 8gb of ram, Radeon 5850. The game looks fantastic even on medium settings. I haven’t tried on High settings yet because eyefinity triples the drain on my video card. However, being that the game feels like it runs smooth I will probably try it out and see how it feels. 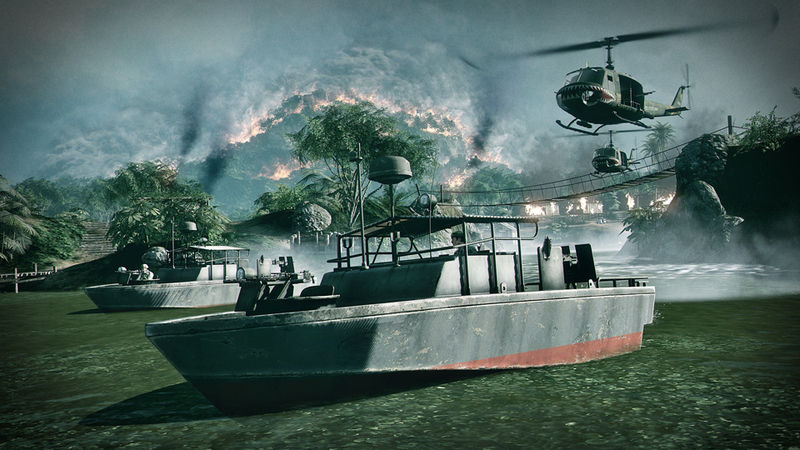 Overall BC2: Vietnam is the best value for your money I have seen in a long time. You get basically an entirely new name with the exception of a single-player campaign for the price of 14.99. This is an expansion more than a DLC but I can’t help but wonder why DICE and EA can put out essentially a new game for 14.99 when Activision can’t even put out 5 original maps for the same price. I’m not a fan of EA but EA and DICE got it right with this expansion. This is one of the best DLC/Expansions of the year hands down. If any of you are considering purchasing this, buy it now, you won’t be disappointed. 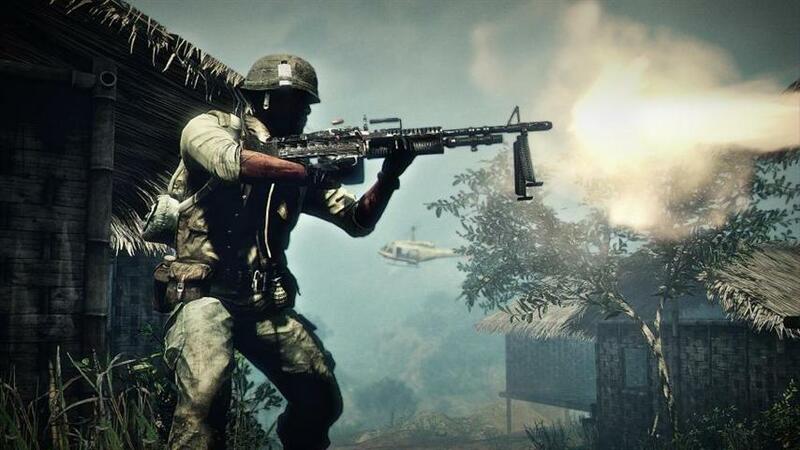 BC2: Vietnam is just freakin awesome, unlinke BC2 where i really only have one favorite map that i play on continuously, I love all the maps in Vietnam, its really pulls you into the multi player experience and Dice is a superb job with the detail. I would have happily paid $20-30 for it. I dont have it on the pc but I will say reverything rings true for the 360 i know a console! but this expansion is awsome!!! as for the vehicles they seemd to be fairly well balanced even more so in the expansion in one game i was able to take down 3 choppers with the medic class ans an m60 the tanks and boats are alittle harder but it’s an awsome experince!! Downloading and installing now, nice review. Looks like you got one. total opposite. The vehicles make it great. bart i agree with you about the vehicles. But the original battlefield games were part of growing up for me. The squad based games made for a blast. I think that i will be buying this DLC whenever funds allow for it. Sadly I have never liked any of the Battlefield games. I like more classic styled fps and vehicles ruin it as far as being the kind of fps I like.